Vaseline FLEUR de LIS Interior - COUNTRY KITCHEN Exterior.Sold for more than $4,000. COUNTRY KITCHEN: This vaseline example having Fleur de Lis interior pattern could well be the lone example in that color. Following reports that John Fenton required “test pieces” before deciding whether they warranted production, this bowl may have qualified in that area. FINE CUT OVALS: This marigold example of Fine Cut Ovals was included in the room display Bob Ray set up during the 2005 Woodsland Convention. The square shape lends another interest to the piece which Bob believes is the only marigold example known having no interior pattern. 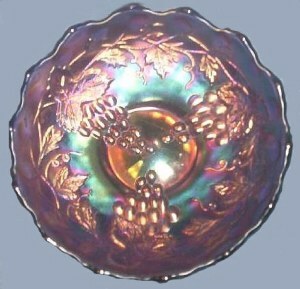 Fine Cut Ovals is the secondary or exterior pattern found on Whirling Leaves bowls in 9”- 10” size. FLUTE or FLUTE and HONEYCOMB: Controversy over various Flute patterns has always existed. Various manufacturers contributed paneled designs, leaving collectors to sort out the differences in many cases. Fragments found at the factory site leave no doubt about the origin of Millersburg as the maker of this colonial style designated No. 400. 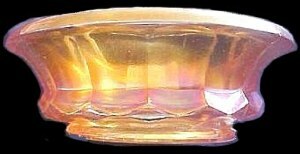 Clarity of the amethyst examples having typical Millersburg iridescence is another clue. 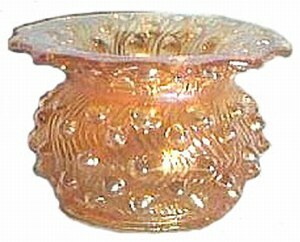 It has the same cloverleaf base and flutes used by Millersburg on the Wild Flower compote. Known in marigold as well. 5 in. Blue - one sold Jan. 2005 on Ebay for $2453.99. VINTAGE: 9 ½” bowls and 5 ½” sauce sizes are the only examples found in this pattern. All have the Hobnail exterior. A very simple pattern, but executed well. The three bunches of grapes hang quite realistically from a wreath of leaves. 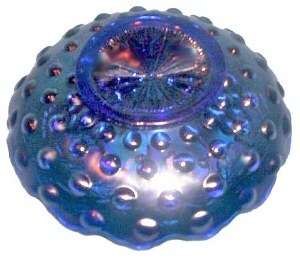 Adding the Hobnail back pattern and the rayed star in the base, this becomes a beautiful and rare bowl. Edges can be ruffled, 3/1 or ice cream shape. 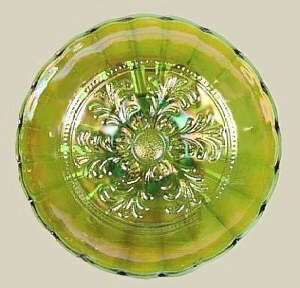 Large bowls are known in green and marigold carnival glass. 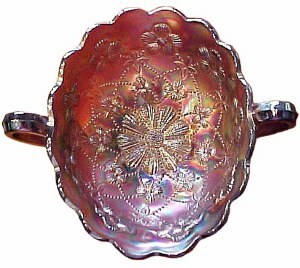 One ruffled amethyst bowl is known. Small bowls are also rare. One example in amethyst, two each in blue and green, and about eight in marigold! HOBNAIL: patterning is a poignant feature in Millersburg production, used on the exterior of bowls, spittoons, jardinière whimsey, pitchers, tumblers, rose bowls and extremely rare table sets, along with vases. Usually blue Millersburg rates highly among collectors, and when that piece is highlighted with the hobnail exterior, interest peaks! 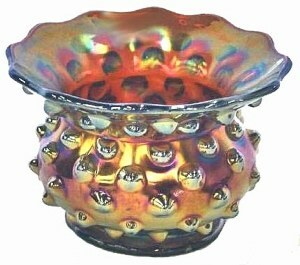 HOBNAIL Spittoon: Known colors in this shape: amethyst, green and marigold. 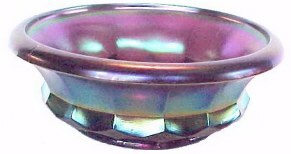 MAYAN: An excellent example of Millersburg radium finish, these 8” - 9” ice cream shape shallow bowls of about 2” in depth, with the beaded center design make quite a statement about the pattern name. This bowl has the star base. It is a unique design in aqua, or olive green, but these colors are extremely rare. Green was the only color known for many years. 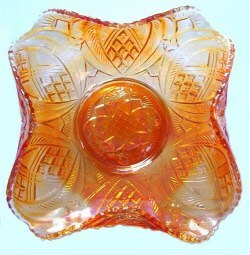 A beautiful ruffled bowl in marigold is an extreme rarity in this pattern. TRACERY: is a pattern confined to bonbons of near-round, square or oval shape. It has a collar base. Measurements are 7 ½” x 5 ½” wide. No exterior pattern exists, but there is a many-rayed star within the marie. Amethyst and green are the only colors known. Amethyst is more rare, but the green is usually better endowed with color and iridescence! RAYS and RIBBONS: While this pattern receives little attention, except for the blue and vaseline examples, the pattern is unique to the bowl shape, carries the exterior CACTUS pattern, which should lend some additional credence, and overall is a very pretty bowl! Carnival colors include amethyst, green and marigold. Two vaseline and two blue bowls are known. An 8” round bowl in heavy dark purple is certainly a rarity. 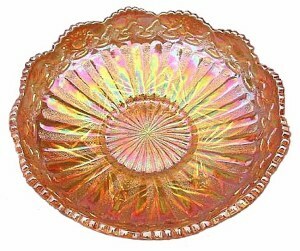 A 10” marigold bowl with almost a clear candy ribbon edge turned outward is a prized piece. 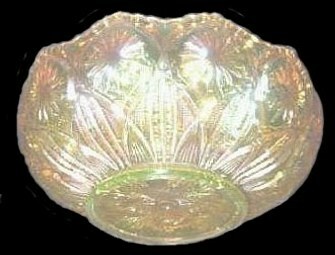 One whimsey in a banana-boat shape is known in green carnival, along with a flat plate reported in amethyst. 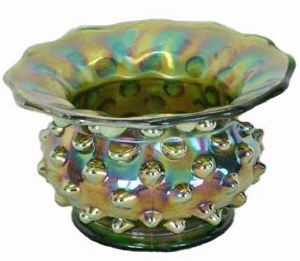 Spittoons come in amethyst and marigold carnival, with a green one reported. Vases are from the rose bowl/spittoon mould. Paul commended the Christians in Thessalonica for showing love toward each other. He urged them: “Aspire to lead a quiet life, to mind your own business, and to work with your own hands…that you may walk properly toward those who are outside” (1 Thessalonians 4:11-12). Our goal should be to please God in everything we do (v.1). It makes no difference whether anyone applauds our actions. We are called to be faithful, not famous. Bad behavior makes news and sells newspapers. Honesty and integrity honor the Lord. Therefore he who rejects this does not reject man, but God, who has also given us His Holy Spirit - the authority of divine inspiration, not the speculations of man (v.8).